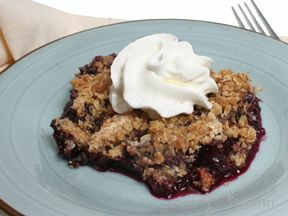 The fresh blueberries give this sweet dessert an abundance of flavor. 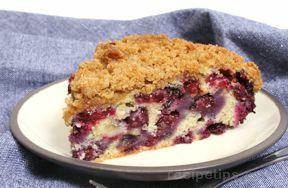 The texture of the crispy topping compliment the flavor of the blueberry and cake-like bottom. Butter the bottom of a 9" x 13" cake pan. Preheat the oven to 350°F. In a mixing bowl, beat the butter and sugar together until light and fluffy. Add the eggs and vanilla to the butter and sugar mixture and then beat until mixed in evenly. In a small bowl mix the flour, baking powder and salt together. Gradually add the dry ingredients to the batter, alternating with the milk. Mix until mixture is all blended. Pour the batter into the buttered cake pan. Spread batter out evenly to cover bottom of the pan. Go through the blueberries and discard any blemished or spoiled berries. 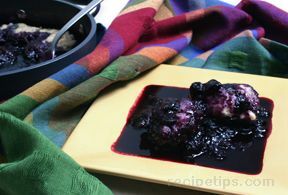 Spread the blueberries evenly over the batter. Mix the topping by combining the sugar, flour, cinnamon, and salt in a bowl and stir with a fork. Cut the cold butter into pieces and add to the other ingredients. Use a fork to work the butter in until all the ingredients are a crumbly texture. Sprinkle the topping evenly over the berries. Bake uncovered for 40 minutes at 350°F. 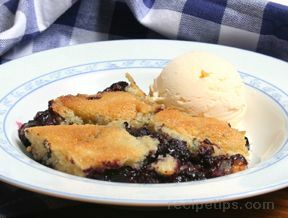 The blueberries should be bubbling and the topping should be a golden brown when done. Serve while warm. Serve with ice cream if desired.